Full board (breakfast, lunch and dinner): Monday 15 – Tuesday 16 – Wednesday 17 and Thursday 18. Breakfast and lunch on Friday 19th. 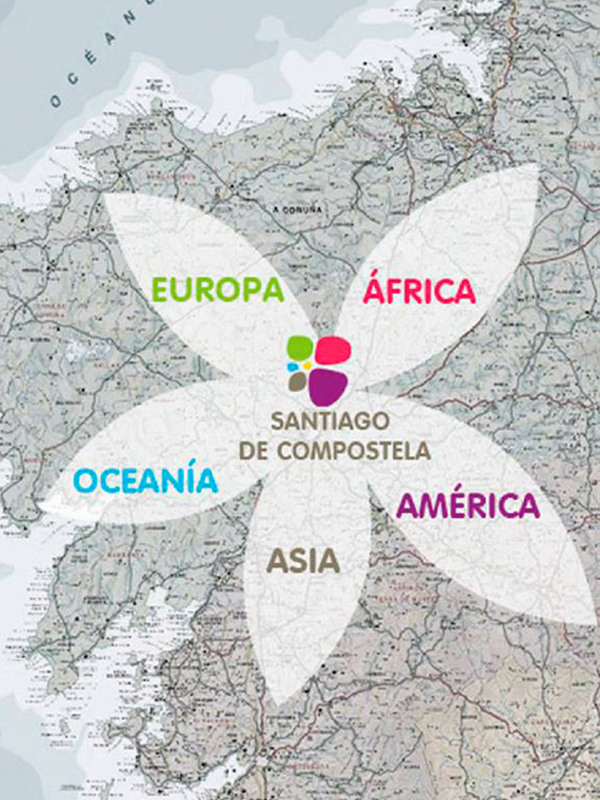 “Meeting of the 5 Ways in Santiago de Compostela”. Sunday 14 – Monday 15 – Tuesday 16 – Wednesday 17 – Thursday 18. The accommodations in the sports centers are provided with showers and bathrooms. 3. Civil Liability insurance for the walker, has coverage from the departure of Monday 15, until Friday 19 to reach the Plaza de Santiago de Compostela. The walker must have his health card. 1 shirt printed as a souvenir from the road. 1 White Rose, as a symbol of Peace. Vehicle support for the transfer of backpacks. – Guides throughout the journey of the road. 5. Participation in the conference to be held on Friday 19 after lunch. Minors are welcome to the Universal Way if they are accompanied by their parents / guardians or guardians who will be responsible for the 5 days. In accordance with the General Law of Consumers and Users, in article 102, we inform that the right of withdrawal may be exercised during a period of 14 calendar days counted from the date of payment of the registration, without any penalty, and without prejudice to exceptions to the right of withdrawal of article 103. There will be no refund of the registration fee 30 days before the start date of the Universal Way to Santiago de Compostela. Camino Universal to Santiago de Compostela is the representative of the website www.caminouniversal.com (hereinafter Camino Universal) and undertakes to fulfill its obligation of secrecy of personal data and its duty to treat them with confidentiality, and assumes, for these purposes, the measures of a technical, organizational and security nature necessary to avoid their alteration, loss, treatment or unauthorized access, in accordance with the provisions of Organic Law 15/1999 of December 13, on the protection of data of personal character, and other applicable legislation. The data collected is stored under the confidentiality and security measures legally established and will not be transferred or shared with companies or entities outside the legal responsible for the web. Camino Universal may disclose any information it deems necessary, including personal data, to comply with legal obligations. Camino Universal with registered office at C / San Antonio, no. 38 – Pl. 1 – Pt. A. Postal Code 15002 Coruña, will be responsible for the file or files containing the information you provide us. Camino Universal will send Newsletters to users. These will be based on the sending of information regarding news, featured content, and commercial information. Camino Universal reserves the right to modify this policy to adapt it to future legislative or jurisprudential developments, as well as industry practices, previously informing users of the changes that occur.